Adam Simpson’s men were jumped by Collingwood early, trailing by as much as 29 points in the first quarter. The Magpies — who were attempting to match Richmond’s achievement in going from 13th on the ladder to premiers — looked like winners for most of the day, but they couldn’t take enough of their chances, and ran out of run at the wrong time. Twelve of the Eagles’ side had played in the 2015 grand final when Hawthorn thumped West Coast by 46 points. The big query going into the day was the fitness of West Coast key defender Jeremy McGovern, who had been slowly recovering from a bump to the hip from Melbourne’s Christian Petracca in last week’s preliminary final. Coach Adam Simpson had declared himself “extremely hopeful” that McGovern would play — the Eagles’ swingman took his place at the captain’s run on Friday afternoon, but the acid test came on the MCG a day later, and he passed. At the other end, the first storyline of the day came when Travis Varcoe — whose sister died after a head injury in a local football game in Adelaide — ran inside 50 and slotted the opening goal for Collingwood five minutes in. 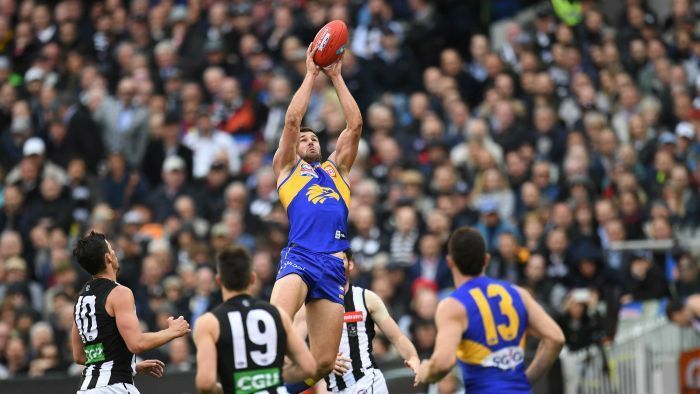 West Coast was looking desperate on the MCG, and Will Hoskin-Elliott added to the Eagles’ problems when he drilled a set shot to make it 5.0 – 0.2. Things were looking reminiscent of the Magpies’ first-half demolition of Richmond last week, but deep into time on West Coast finally managed to get on the board with an unlikely effort, as the ball bobbled in the goal square, and Willie Rioli managed to get the back of his shin to it before it crossed the line. Then with a minute to go, Luke Shuey found Kennedy for a mark close to goal and he converted, to leave the Magpies’ lead at 17 points at quarter-time. Collingwood’s Brayden Maynard came off with what looked like a dislocated shoulder after he tried to contest a ball inside defensive 50 just before time on. He did not return to the game, leaving the Pies one down for rotations. At the break, the Magpies led by just two straight goals but had laid an incredible 58 tackles to the Eagles’ 34. The Eagles were lifting, and Lycett found Darling near the goalsquare for a fiercely contested mark. He kicked West Coast’s third of the quarter.